Scrambled eggs for us have been a before-exam special breakfast - or something for the weekend. Any day is good though: my scrambled eggs are quick and easy - and eggs are the perfect protein. The real art is not overcooking (Jane). 1. 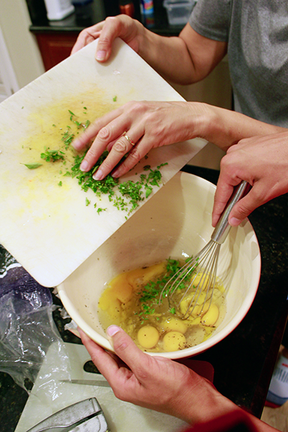 Crack eggs into a mixing bowl. Add milk and salt and pepper. Whisk with a fork until well combined. 2. Melt butter or margarine in fry pan - wipe out any excess with paper towel - you just need to have enough so the eggs don't stick. 3. Pour egg mixture into heated pan and using a wooden spoon stir to pull cooked egg away from the side of the pan. Don't over cook! You don't want scrambled eggs that are hard and they will continue to cook a little even after the heat is turned off. 5. Serve scrambled eggs on hot buttered toast. Add some herbs to decorate. Voilà! Mix in some herbs while cooking eggs - parsley goes well. Or even some sun dried tomatoes. Or serve on toast with smoked salmon.